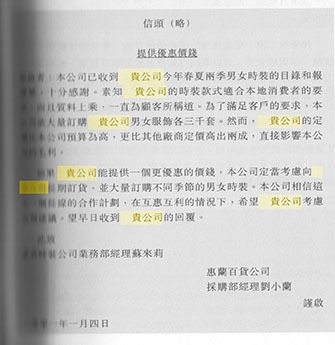 This sample is taken from page 179 in Communication in Chinese: On Writing (ISBN 962-937-068-9), which is essentially a style manual for the Chinese language as used in Hong Kong. It was published by the City University of Hong Kong in 2001. In this example, the honorific space has been applied to the phrase 貴公司 (“your [honorific ‘your’] company”) instead of a name. The second paragraph in the example shows an instance of the honorific space and the marked phrase being interrupted by a line break.